Are you running around like a headless chicken trying to balance work, family, chores, Christmas shopping, wrapping presents etc.? Well, take a break for a few minutes and enjoy a Tudor treat. Today’s Advent Calendar treat is from yours truly and I hope you enjoy it. Teaser: it has something to do with the person who wrote “At Christmas I no more desire a rose, Than wish a snow in May’s new-fangled mirth;”. 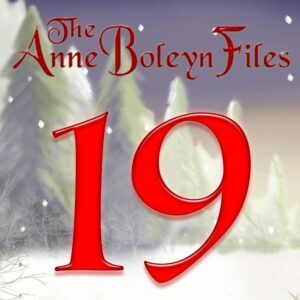 Have you been checking the Anne Boleyn Files Advent Calendar every day? If not, “fear not”, for you can enjoy the previous 18 treats by just clicking on the numbers. You can find the Advent Calendar here, or by clicking on the number 19 in this post, or by visiting the site daily and clicking on the link in our top cover image – easy! Thank you for the wonderful photos Claire. I watched a documentary on YouTube a couple of years ago about the construction of the Globe. Very interesting. I would love to see Shakespeare performed in that venue. We have something here called The Oregon Shakespeare Festival. It is in Ashland which is in the southern part of the state. It is an outdoor venue with a covered stage. The set up is much like a Roman odeon. The festival attracts both local companies and well known actors. It has been open each season since 1935 with the exception of 1941-1946 due to the war. I’ve only gone once, in 1980 and it was fantastic. The performance started after dark and to sit out in the open under the stars watching live theater was a beautiful experience. That’s ok. I loved visiting it, it was a wonderful place. A couple of our tour group managed to get tickets to see Mark Rylance in Othello – I was so jealous! It was very interesting and we have Sam Wanamaker the American to thank, and how apt is his name, (for Uncle Sam’ is what we fondly call America) to have the Globe built so we can see her how she looked in Elizabeth’s day,I am sure the bard himself would be suitably impressed it is a lovely work of art and it was very interesting watching the actors speak and seeing them at work, all great thespians long to act in a Shakespeare play its what makes them stand out as actors it’s a sign of great talent, and most consider it an honour to play one of his characters, stage acting is much more harder than film and television as it is live and the pressure must be enormous, the theatre was the main source of entertainment in early times and Charles 11 was a great fan, it is where he cast eyes on Nell Gwynn who became one of his favourite mistresses, in those days to be an actress was considered little better than to be a prostitute, and it was women of the lower classes who worked in the theatre, many entertained gentlemen of the court afterwards it was were they earned a few extra silver or gold if they were lucky, it was an easier exsistence than some of the jobs that Tudor and Stuart women had to do for a living, I have always loved the theatre and on Saturday I am going to see the Nutcracker at the Coliseum, interesting post Claire thanks very much. Yes, we owe a lot to the late Sam Wanamaker. I also visited the original site of the Globe, which is just around the corner. Sam wasn’t able to build his reconstruction there as there is a listed building on it. The Globe is well worth a visit and I would love to see a performance there. Oooh, the Nutcracker! I’d love to see that! Have a wonderful time. Thanks Claire I am really enjoying your advent calender, it’s exciting to see what treat there is every day. Thanks Claire, I always get a good seat in the dress circle, havnt been for some time so am really looking forward to it, I’d like to add I’m really enjoying your advent calender, there’s always something so interesting and it’s a nice little treat to look forward to every day. Think about how many well known actors past and present have come out of the Royal Shakespeare Company! Yes I know that William Shatner ( of Captain Kirk fame ) was a Shakespearean actor, bet he looked tasty in tights. Patrick Stewart, David Tenet. Just the ones I could think of on the fly. That’s right I think David Tennet played Richard 111? Thanks for sharing your photos with us. We have a festival in September in various places including Liverpool Cathedral and another in April. A canon burning down the Glode during the unfinished Henry Viii in 1613. And I thought it was Macbeth which was supposed to be the unlucky play. Yes, Shakespeare as a writer and entertainer was a genius, if people remember he wrote for entertainment and political purpose, not to present actual history. In fact his history is nonsense as history, but as political theatre it is very clever. There is nothing like a touch of the Bard. Long may he be performed. We didn’t have time to do the New Globe when we were down there but we had some time at the haunts of the Bard this summer, his house, his school and Guildhall and the farm of Mary Arden, All Saints, but yes, definitely, this man is everything you could want in a playwright, because he wrote from life. Evidence that it was the Bard himself, our Will who wrote his own work is within the plays themselves and the Sonnets because he wrote of local things, he wrote from his life and beliefs and he wrote about the family business. There are local words which Shakespeare would have been familiar with, there are clues to his “lost” years and to the subversive world in which these men survived and even to his father’s illegal wool trade. Anyone who thinks our local lad from Stratford didn’t write the works associated with the name Shakespeare are loony tunes and the reason he was able to write so was because he was blessed with a gift. The language of his plays is so down to earth as to only have come from someone who has seen the reality of a Tudor police state, the reality of everyday life, even hardship and struggle, before making enough money to settle down in some style. His parents had money and land, but they lost it because John Shakespeare was both a gentleman and a crook, was both a merchant and glovemaker and a money lender, a respectable member of the town council and deep into the shady side of the wool trade. His mother was the daughter of a gentleman farmer with land and had land of her own. The family were dragged into a ridiculous plot to kill Elizabeth, although they had nothing to do with it, because one of their cousins, Edward Arden was involved with a nut case called Somerville who drunk one night said he was going to kill the Queen. The houses of every family member was searched. Fines for illegal activities and this lost their fortunes so William had struggled. Everything the family went through has been referenced in his work, as has his own personal tragedy, the loss of his ten year old son. The Bard speaks in his plays which makes him the greatest genius and playwright and wordsmith our country has known. Yes iv always said we maybe useless at cricket, but we gave the world William Shakespeare!